Where do I start with this review except to say it's one of my absolute favourites to date, so much that we are going back end of the month bank holiday weekend! This is another restaurant in the new WestQuay Watermark and it's a fairly new one in this country L'Osteria. If you have travelled around Europe you may have seen them dotted around Germany. This is the second restaurant they have opened up in UK with the first being Bristol - how lucky are we! They have a fabulous kids meal which is very important for us these days when eating out and being child friendly is a must. You want to eat in a place where you feel relaxed with a kid and to enjoy your meal, making food fun for the little one. So what did we eat....we were given some bread while we waited for our food to arrive. For starter we shared a stunningly delicious beef Carpaccio from filet of beef with rocket, parmigiana reggiano. Little annoyed I had to share my portion with hubby but we needed room for the huge pizza for mains! 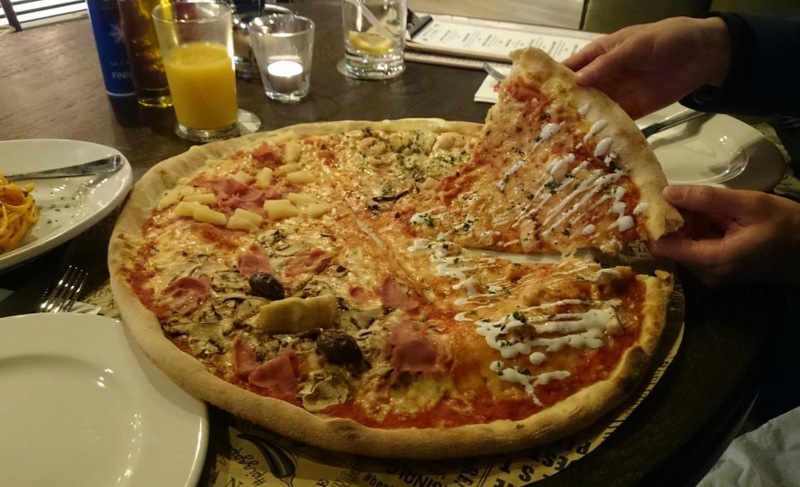 So, yes this will give you an idea of the size of our pizza...it's so big it hangs off the plate which is probably why we were given this sheet of paper to support it so it's not on the table. It was so difficult to choose which one but the chef kindly offered for us to pick 4 different flavoured toppings to try out - Hawaii pineapple and shoulder of ham, Marinara seafood cheese and garlic (ur favourite topping), Capricciosa shoulder of ham, mushroom, salami and anchovies and lastly Salmon mozzarella, salmon with sour cream. We also shared a pasta which was SO SO good and I have to say we both enjoyed the pasta way more than the pizza because it was that good. This is the linguine with prawns, sumo aurora, brandy, garlic and piccante. The sauce was nice and creamy with the perfect amount wrapped in the linguine and you cannot taste any brandy at all....this is the reason we are returning for another bowl of their delicious pasta!!!!! We were both very full after the pizza / pasta and we really wanted to try the desert so we picked the Piccolo Duetto two-bowl dessert we picked the cream di fragola and panda cotta. Both perfect size if you are full and you fancy a little something but not too big. We received wonderful service and really enjoyed our evening, I cannot wait to go back for lunch with the little one end of this month.